Internal Battery with Micro-USB Charging. Lasts up to 1.5 hours at 100% brightness and 13 hours at mininum brightness. at 100% brightness and 13 hours at mininum brightness. Comes with gels filters for Tungsten (CTO) and Daylight Diffusion (3200-5600K). Universal adapter included to mount it on the hot-shoe of a camera, tripod, light stand or other supports using the 1/4 inch screw thread on the underside. 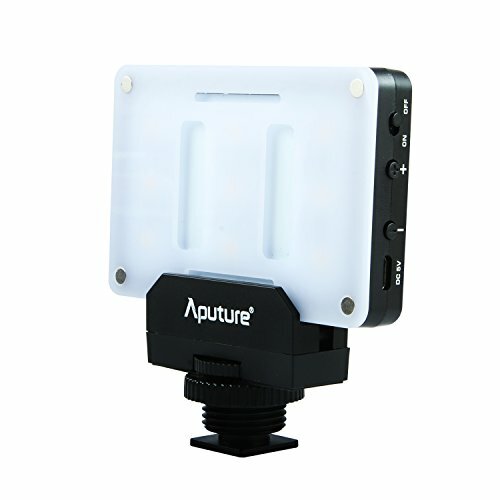 9 Steps Dimming Pocket sized LED fill light. Incredibly compact and lightweight(140g). Good for Narrow place. 9 High Efficiency SMD Bulbs, 900LUX@0.3m; 350LUX@0.5m; 80LUX@1m, alternative close-up fill light. TLCI 95+ CRI 95+, Excellent Color Restoration in Photo and Video Applications.